Our Design Style Profile enabled the Schroeder’s to define their style, recognize the things they loved most about their home, and pin-point exactly where they needed to spend their money to get the look they really wanted. helping us determine what our options were and where we should head with our design. They gave us confidence in the final product and they really made a huge difference in the feel of our home!" The Schroeders, a family of six, were looking to freshen up their home but were having a difficult time knowing exactly where to start. We helped them lay out their space, organize their thoughts, define their style, and used that style as a filter to decide what items to keep and what items to let go of. The only major construction required was replacing the counter tops, the backsplash, a few key light fixtures, and a fresh coat of paint. By using as much of their existing furnishings as possible, we were able to A) make the remodel efficient, and B) ensure their home was a true reflection of their family instead of just mirroring a picture in a magazine. In the end, we were able to take varying opinions, including their wants and needs, and funnel them into a cohesive design plan. Our Design Style Profile helped them confidently spend their dollars and helped them feel even more invested and connected to their home. Painted the entry, living, and kitchen a fresh color, which helped the house flow better and brought in more natural light. Updated the kitchen counter tops from tile to a solid surface. 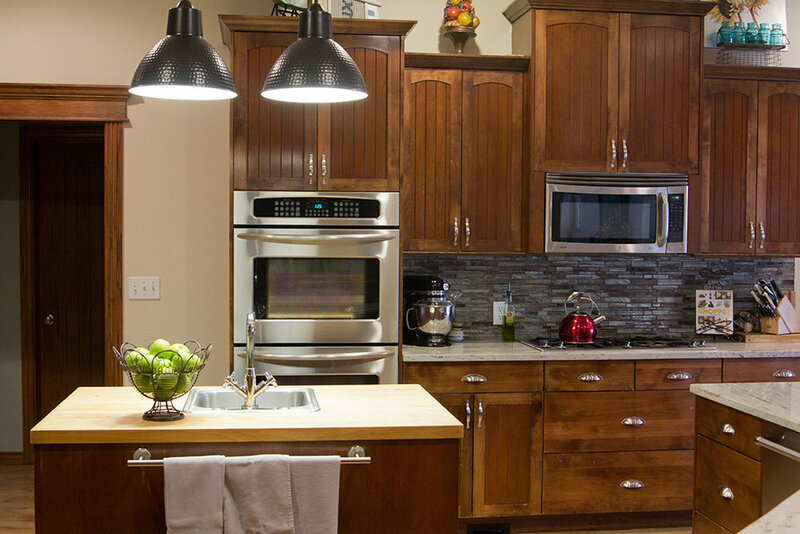 The original dark cabinets were better balanced throughout the space with a light counter top and backsplash. Added a metal kick plate and toe rest with new industrial inspired stools to the bar. 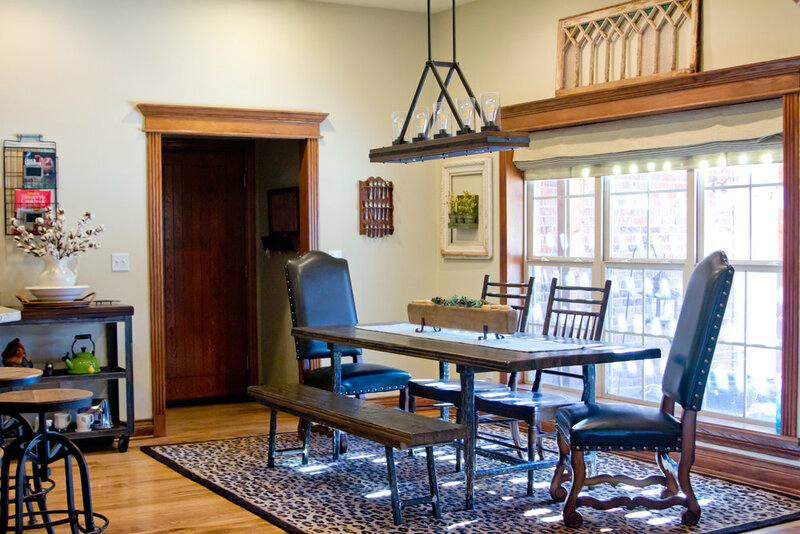 Swapped standard home builder light fixtures with statement pieces to help tie the open floor plan together. Replaced outdated window treatments with roman shades. Lined with canvas, they added another layer of texture to the space. GCD brought personality and storytelling back into the home by utilizing souvenirs from the couples travels and handmade art from their children as décor elements. For example, a standard bird cage was replaced with a vintage one to add more character, and the family later refurbished an heirloom bookshelf.